The Red +Black Architect started as an after-hours hobby in 2012. It was a platform to talk about architecture and the built environment in a straight forward way, such that the public could get an insight from an architects perspective. Five years on, it has achieved some extraordinary things. From discussions with leading architects and influential politicians through to coverage of major events and local controversies, The Red + Black Architect has provided a unique lens on the architecture scene in Melbourne. This was only possible due to a confluence of factors for which I am incredibly grateful. It never ceases to amaze me how supportive Melbourne’s architecture community can be. To all those who have been interviewed, written guest posts, shared content, commented on or read articles, thank you. Particular thanks must also go to Olivia, Sonia, Justine, Alison, Peter and Stuart for your incredible support and encouragement. 2017 marks five years of substantial and sustained cultural change within the Australian Architecture profession. On this International Women’s Day it is timely to reflect on how far we have come towards a diverse profession, as well as how far we have still to go. 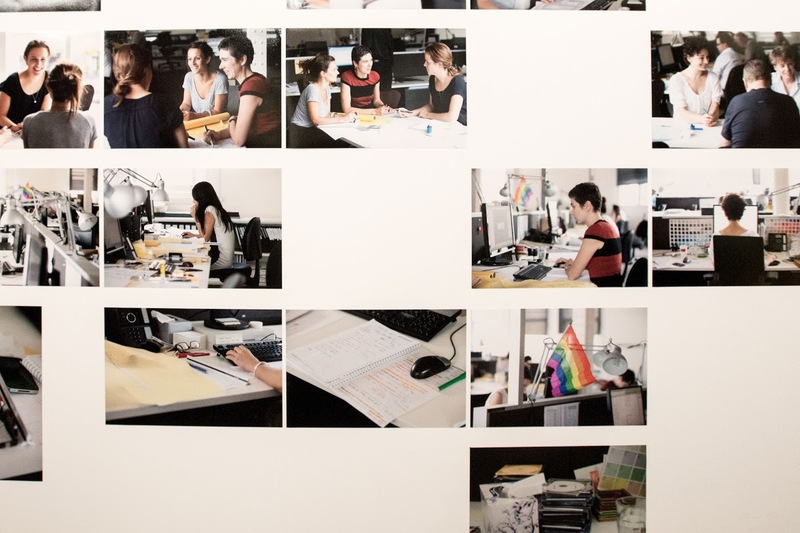 In May 2012 the website Parlour: Women, Equity Architecture burst onto the scene. Armed with a potent mix of rigorous scientific data and digital media savvy, it demanded attention from all levels of architectural practice. It could no longer be argued that architecture didn’t have a gender problem, all that was left was to figure out what to do about it. In 2013 Parlour hosted perhaps its most pivotal event to date, Transform: Altering the Future of Architecture. The central question of this full day seminar was: If architecture were more inclusive would it also be in a stronger position? This broad ranging question intentionally made diversity everyone’s business. Transform was also the debut of what eventually became the Parlour Guides for Equitable Practice. This award winning and internationally significant publication takes individuals and practices through the major causes and resolutions of inequality in architecture. These guides have had such an impact, that the American Institute of Architects is now beginning to look at producing a similar set of guides for their own members. Perhaps change over the last five years has been most notable in the Australian Institute of Architects itself. In 2013 the Institute announced its new Gender Equity Policy and a National Committee for Gender Equity. This triggered a raft of changes within the AIA, some subtle, others more obvious. There have been CPD events, media interviews, policy reviews and a new national award: the Paula Whitman Leadership in Gender Equity Prize. This award was presented for the first time two weeks ago to Catherine Baudet, who has been advocating strongly and effectively for gender equity for well over 30 years. The Institute has also undergone a substantial change of leadership. From May 2016 Jenifer Cunich, the Institutes first female CEO has been at the helm. Supporting her is a new board of directors, which will at all times have a minimum of three men and three women to ensure gender diversity. There is a familiar saying that ‘if you can’t see it, you can’t be it’. Looking across the key positions in 2017 it is clear that regardless of your gender you could be anything from the State Government Architect, to the CEO (or board-member) of the AIA or the Registrar of the ARBV. This is a substantial difference to just five years ago. So after five years of substantial change, where are we now at? Have we turned the ship around? It would certainly seem that there is more awareness within the profession of ethical work practices and gender equity issues. Parlour has also reported an increase in the numbers of women registering as architects. 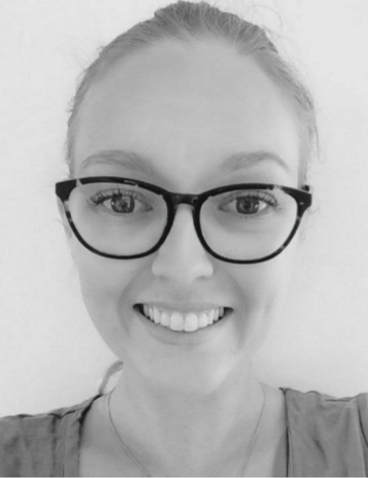 Between 2012 and 2014 there was a 16% increase in the number of female registered architects, bringing the percentage of female registered architects in Australia from 20.5% to 22.2%. (source). These percentages identify two aspects to the progress so far. Firstly that things are going in the right direction, but secondly that there is a long way still to go, given that universities graduate similar numbers of men and women. In 2017 it is also clear that there is substantial and growing interest in all manner of social justice issues within the architecture profession. 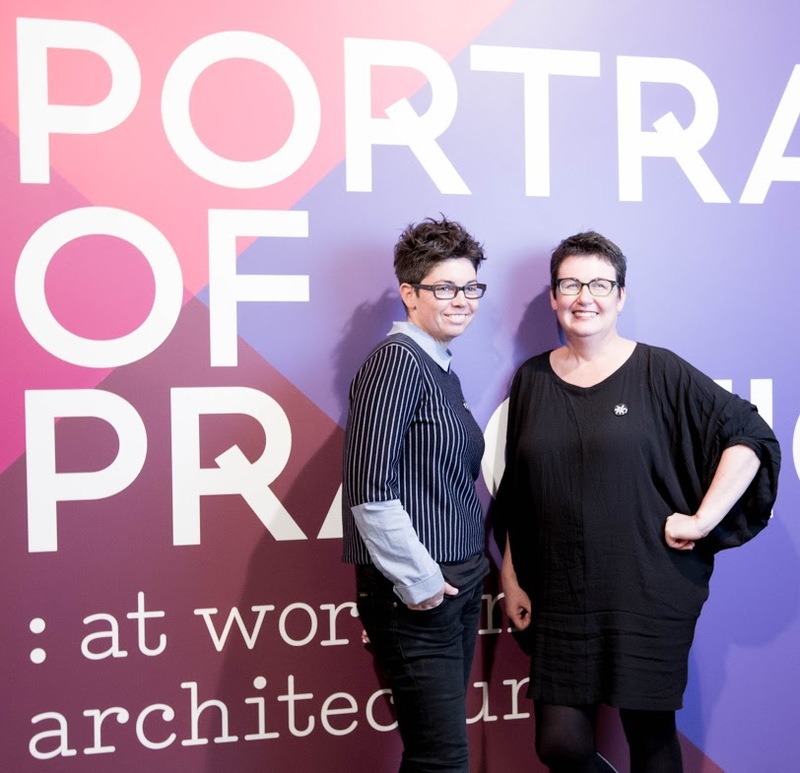 Earlier this week at Process, the monthly forum aimed at graduates and students of architecture, over 200 people turned out to hear an all-star panel of women discuss gender equity, diversity within the profession. After five years of active discussions within various architecture forums, there is no sign of ‘issue fatigue’. What these discussions are revealing however is the huge next hurdle that awaits us, cultural diversity. Without in any way slowing down, or diverting from tackling gender inequity, it is being understood that we have to start taking on this issue. As Parlour has shown us already, step one is to get the data. Once again Melbourne has turned it on for the spectacular cultural juggernaut that is White Night. A crowd of around 600,000 took part in the all night festival of projections, performances, artworks and installations. Stealing the show again this year was the extraordinary projections upon the Royal Exhibition Building. The Light show entitled ‘Rhythms Of The Night’ by White Night & Artists In Motion, depicted the four stages of sleep. These fantastical scenes were at times like that of a Halloween nightmare, with spiders and skeletons. The dream would them move on by disintegrating into vibrant black and white patterns reminiscent of MC Escher. Supporting this main event, were a number of excellent installations throughout the Carlton Gardens Precinct. Sailing in between the Melbourne Museum and the Royal Exhibition Building was ‘The Pyrophone Juggernaut’. Part steel pirate ship, part musical performance, part pyrotechnic show this collaboration between Hubbub Music and Strut & Fret was a real crowd favorite. Nearby, the Sonic Light Bubble by Eness and Pixel Fruit by Tim Newman both created valuable support pieces to this precinct, which as a whole was a significant improvement from previous years. In Flinders Street, the ‘usual suspects’ between St Pauls Cathedral and the Forum Theatre were lit up with vibrant animations. This year the theme was ‘Fractured Fairytales’ which gave some traditional fairytales a Pop Art feel. In the southern gardens, participants were greeted with any number of unusual sights and experiences. The White Knight Messenger, a superb piece by Blanck Canvas, patrolled St Kilda Road, moving majestically between the Elm trees. Another White Night favorite is the State Library of Victoria which was illuminated both outside and from within the reading room. This year punters were taken on a trip beneath the waves, to view the seascapes of Port Phillip Bay. Seals, Seahorses and a swarm of crabs all made for a surreal library experience in the middle of the night. Outside the library a group of protesters took the opportunity to make their views known on the City of Melbourne’s homeless ban. Their protest was peaceful and undertaken with great respect. Perhaps no building is more suitable for dramatic projection than the National Gallery of Victoria. The smooth bluestone facade beyond the rippling water fountain could make any moving image sing. This year the fashion designs of Victor and Rolf were chosen to bring the colour and style. Whilst it probably didn’t live up to the highs of last year, it remained a spectacular contributor to the evening. Not all parts of the program were brilliant successes. The illumination of the Coops Shot Tower at Melbourne Central was quite underwhelming and the limited scope of the Flinders Street Station projections (although high in quality) would have disappointed some. Overall White Night 2017 was another shining success for the arts and urban culture in Melbourne. Yet despite the 600,000 strong crowds and the crowding issues having largely been resolved, there is a determined force that is working to undermine this event. Some sections of conservative politics are attempting to politicize the event as a law and order issue. This is being readily facilitated by some sections of the media who are continually pushing fear. If you were to read the Herald Sun at the moment, you might think Melbournians shouldn’t leave their homes for fear of certain death. The reality at White Night however that there were ample police available to respond to the slightest issue. The White Night crowd size of 600,000 punters is roughly equivalent to the size of 6 Melbourne Cup crowds. Despite this huge number, there were just 21 police arrests. By comparison there were 9 arrests at the Melbourne Cup in 2016, well over double the arrest rate per patron. There are always going to be incidents when there are large crowds at events, but to push fear for political gain, is petty and irresponsible. White Night is a celebration of our diverse society together, enjoying the vibrancy of our city, contesting ideas, experiencing culture and participating in urban life. It is hard to remain positive reflecting upon the year that is now rapidly drawing to a close. 2016 has been a difficult and particularly disliked year. To the despair of many, the world lost some of its cultural giants, David Bowie, Prince, Leonard Cohen and Mohamed Ali, to name a few. At times it seemed like a week could not pass without another icon leaving our midst. Australian architecture also lost giants. Paul Pholeros AM the founder and driving force behind Health Habitat, Romaldo Giurgola the architect responsible for Australia’s New Parliament House, Stephen Ashton from ARM in his AIA Gold Medal year, and another Gold Medallist Peter Corrigan AM, from Edmond and Corrigan all left us in 2016. They will all be greatly missed for what they gave the architecture profession. Many will look back on 2016 as the year of Brexit and Trump. The year great democracies chose building walls over building bridges. Australia, despite our geographic isolation, has not been left out of this reactionary, fear driven club. 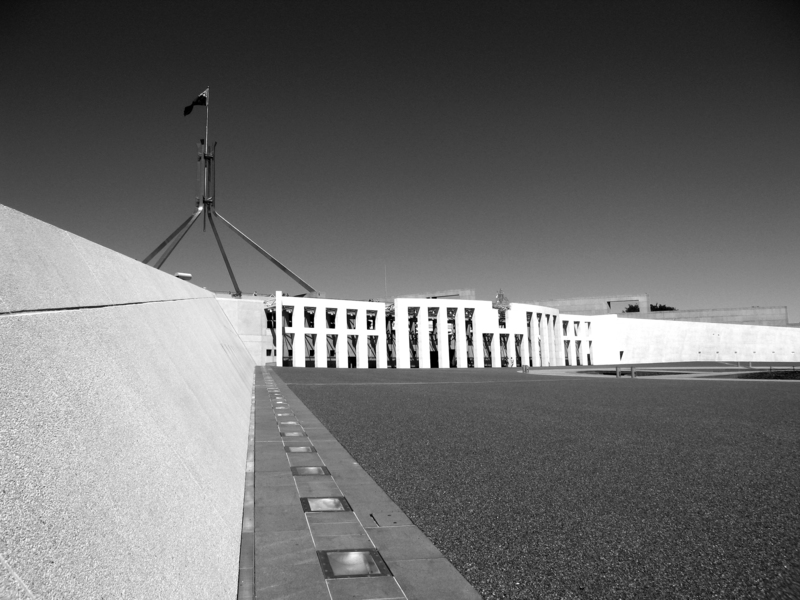 Our Federal politicians are building their own fence, around our Parliament House. The house Romaldo Giurgola designed as an expression of our democratic freedoms, is to be undermined by wire and steel, excising the building from the founding ideals of our democracy. The popular thinking for the moment is that if we continue to build walls, fences, detention camps and surveillance we will eventually be able to isolate the good from the evil. We will be able to prevent unwanted people, unwanted ideas and unwanted change. Those within the sanctuary will prosper and those outside it, well who cares about them anyway. This ideology of divisiveness will not deliver harmony nor prosperity. It will instead harbour inequality and resentment, which are at the very cause of the anger levelled against our democracies and the fear within them. As we approach a new-year we as Australians find ourselves at a fork in the road. Should we follow the United Kingdom and the United States down this dangerous path, or should we take the opportunity to boldly set our own direction? There is opportunity here if we want to seize the day. As the US and the UK move to reject their migrants, Australia should forge its own identity as a destination for the world’s talent. Melbourne is already a living breathing example of the benefits of a truly multicultural society, reaping the economic, cultural and social rewards. Perhaps it is not up to architecture to change the world, however it can certainly aspire to reflect the very best of our society, rather than merely react to the climate of fear. As architects who wish to pursue this better vision, who better to turn to for inspiration, than our dearly departed giants. In 2017 architecture should strive for compassion. The type of compassion that Paul Pholeros showed by working to achieve basic amenities for disadvantaged communities. As the gap between the rich and the poor continues to grow, so too does our need to provide environments where everyone can prosper. From well-designed housing solutions through to schools and community centres, our built environment is critical to providing a level playing field for all. In 2017 architects need to grow bolder and more confident. The type of boldness and confidence that Peter Corrigan and Stephen Ashton showed was possible. We need to prove again to the community that it is ok to leave the tired tropes of the 19th and 20th century behind and push ahead into a future of our choosing. Finally in 2017 our architecture should embody the ideals of our diverse society and of the democracy we live in. Romaldo Giurgola, a migrant from Italy, embedded this within our Parliament House, and in doing so, wrote a design constitution for our nation. We need to defend this constitution with future architecture that allows us to walk as equals, whilst tearing down the fences and barriers that divide us. 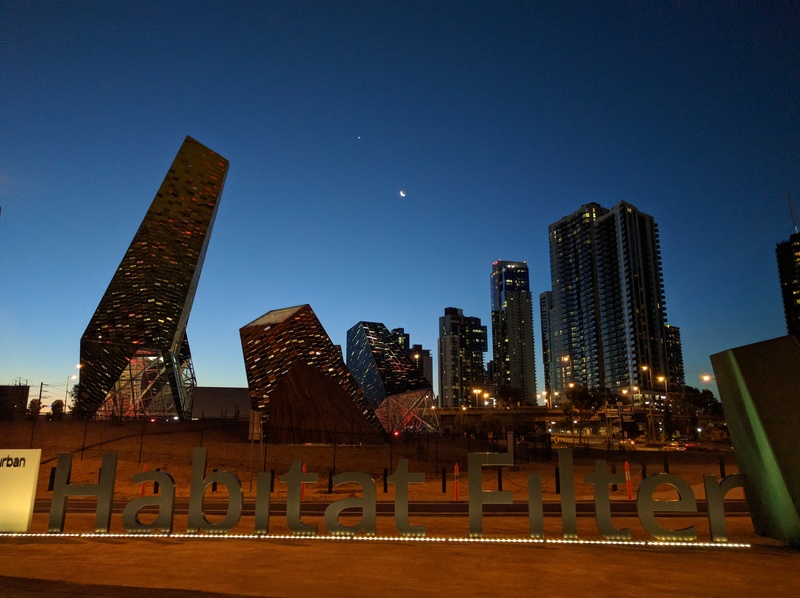 In a city that boasts an impressive collection of freeway architecture and roadside sculpture, Melbourne’s new Habitat Filter looks to set a new benchmark in urban art. The Power Street Loop has been an industrial by-product since the construction of CityLink by Transurban in the late 1990’s. 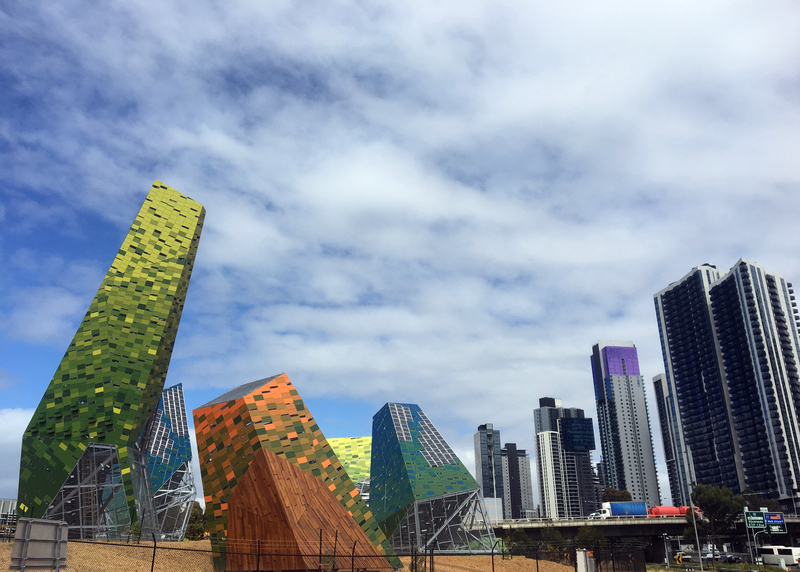 This island site sits isolated inside a ring of bitumen and fast moving traffic, but is now home to Melbourne’s latest piece of urban art – Habitat Filter. 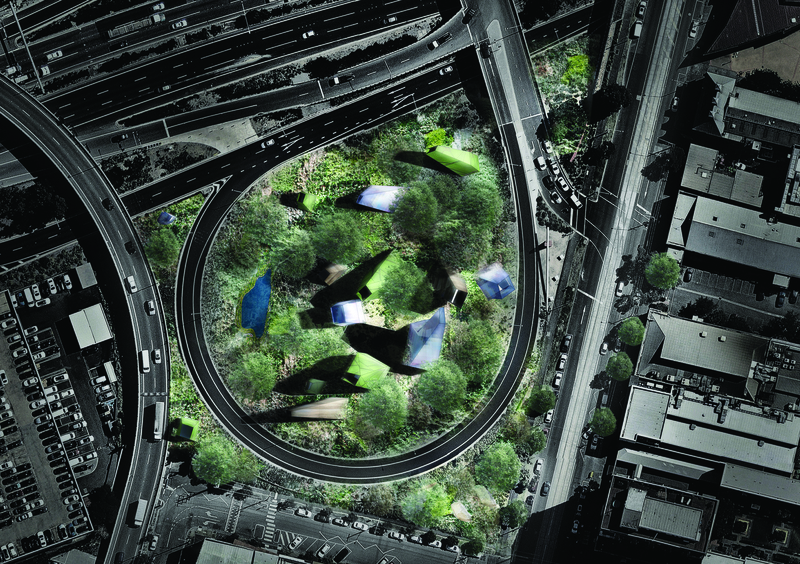 The project itself is the result of an open design competition held by Transurban. 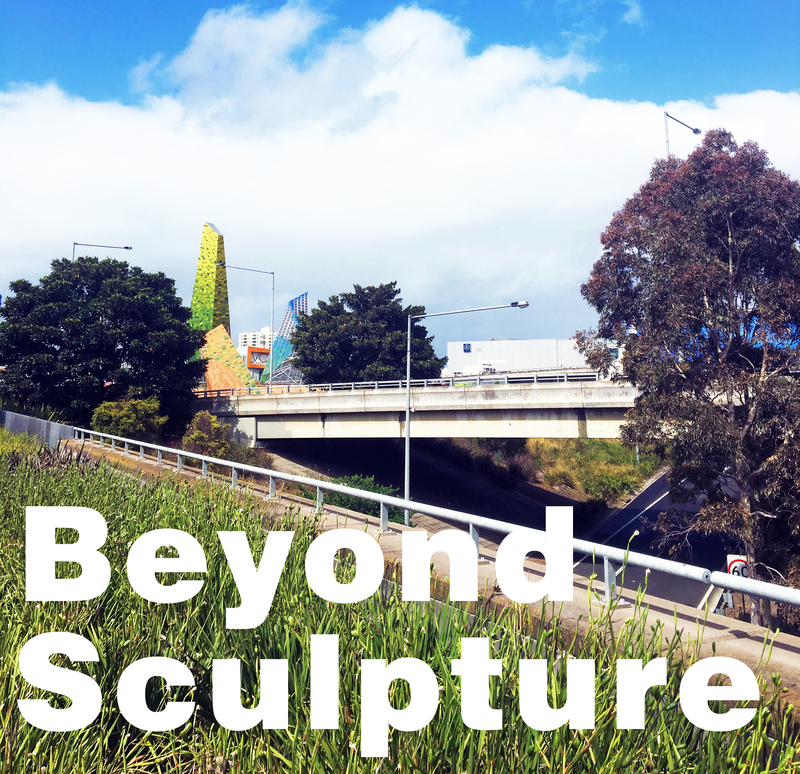 Landcare Australia were looking to re-vegetate and rehabilitate the site, whilst Transurban were also looking for a sculpture that would sit comfortably within the adjacent arts precinct. The winners of this competition are a tight group of design professionals each with their own complementary skill sets. Urban designer, Matt Drysdale and graduate of architecture Matt Myers both have strong architectural backgrounds, whilst Tim Dow who studied landscape architecture, also brings to the team substantial expertise in wayfinding and user experience. 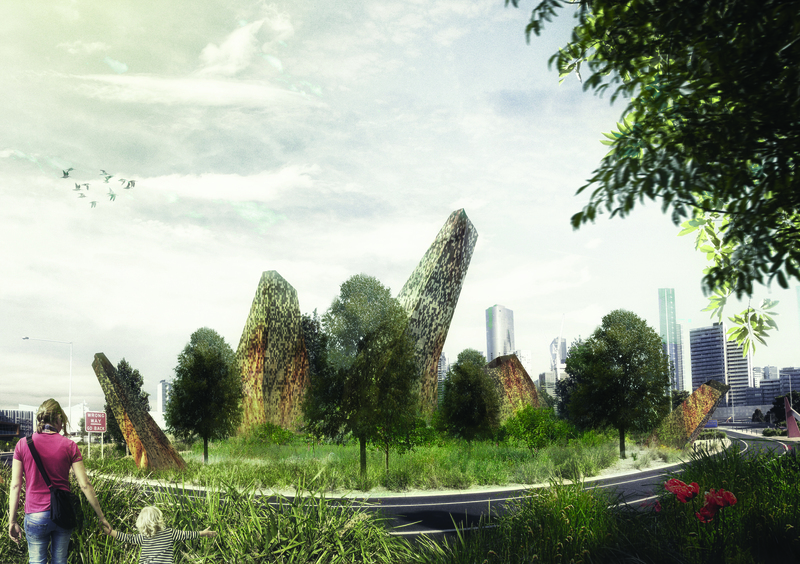 The result is a collection of monoliths playfully interspersed around the site. During the day, the colourful pixelated cladding on the structures feather their colour as they reach for the sky. 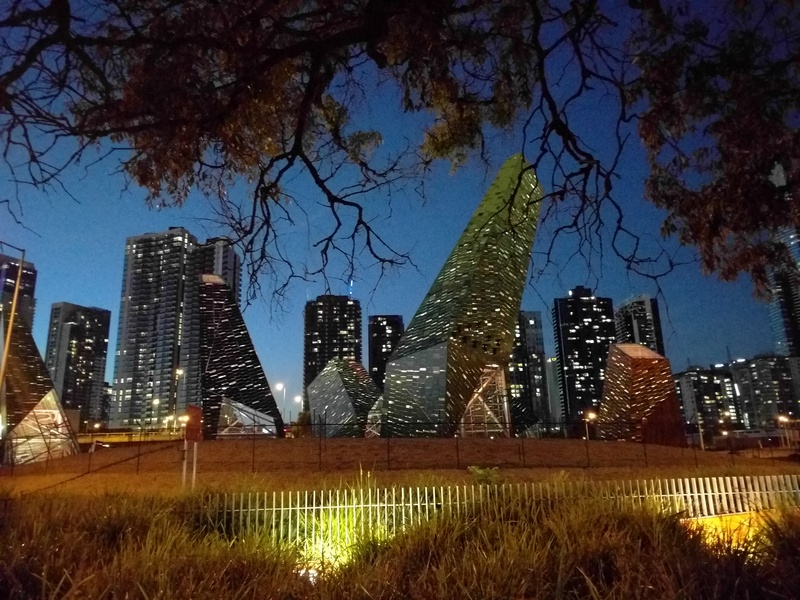 At night the angled forms suggest a critical reflection upon the apartment buildings of the Southbank skyline, as the lighting from within the sculptures mimic the lights within the buildings beyond. Whilst the monolithic forms and the vibrant colour pallet are bold and distinctive, the more functional aspects of the project are less obvious. For the design team there was a conscious decision not to just have a meaningless object in space, it had to be more than a ‘one liner’. As the name Habitat Filter suggests, the intention was to create habitat for birds, insects and other small creatures, whilst allowing natural vegetation to filter the air. “We are interested in how the urban and natural environments interact. The form becomes secondary to the more the pragmatic processes of capturing [water and sunlight], filtering [air] and creating habitat”. Sustainability was embedded within the brief of the competition. The steel and concrete used within the project contain high levels of recycled content. The lighting of the sculpture at night is powered by the integrated solar panels and the natural vegetation is maintained with rainwater collected on site. When running the competition Transurban had to allow for the possibility of an artist winning the competition and had therefore arranged for the winning design to be documented and delivered by Tract Consultants. For design professionals accustomed to the process of documenting and delivering projects this might have been a strong point of contention. However Drysdale, Myers and Dow were relaxed about this process, having great faith in the team at Tract to deliver on their design. Perhaps the most unusual aspect to this project is that within our city it is one of very few places where vegetation is encouraged and people are specifically excluded. Whilst Melbourne is fortunate to be well serviced with parks and vegetation it is very difficult to think of any other such space where people cannot visit. For some, such as the outspoken Lord Mayor of Melbourne, Robert Doyle, this is a missed opportunity. He described Habitat Filter as “too intrusive” and just “a road with some stuff that you look at”. The issue of pedestrian access is an interesting one that the winning design team did consider carefully. Due to the nature of the site within the freeway context, pedestrian and public connection into the loop site was ruled out as an available option. This however creates a unique opportunity to provide dedicated space back to flora and fauna. A “human” free zone. Habitat Filter with the sculptures complete, awaiting vegetation to grow. Visiting the site today, whatever you might think of the sculptures, it is still just a work in progress. Whilst the built environment components are complete, the natural environment is only just getting started. Over time the steel mesh will be used as scaffolding for creepers to grow, and the bird boxes will become nesting spots for Melbourne birdlife. The true measure for this site will be how well the natural elements will thrive within the hostile setting that surrounds the site. The decision for Transurban to hold a design competition and invest in the built environment in this way is to be applauded. As a result of this commitment, our city has a new multifaceted sculpture that is a provocateur of thought, and a unique environmental refuge. As our city continues to grow and evolve, it will only become more important to allow spaces such as the Power Street Loop, where the natural environment can thrive alongside the built environment. Architecture is a reflection of culture. For architects, understanding and responding to culture through design is a critical part to achieving buildings that resonate with people. 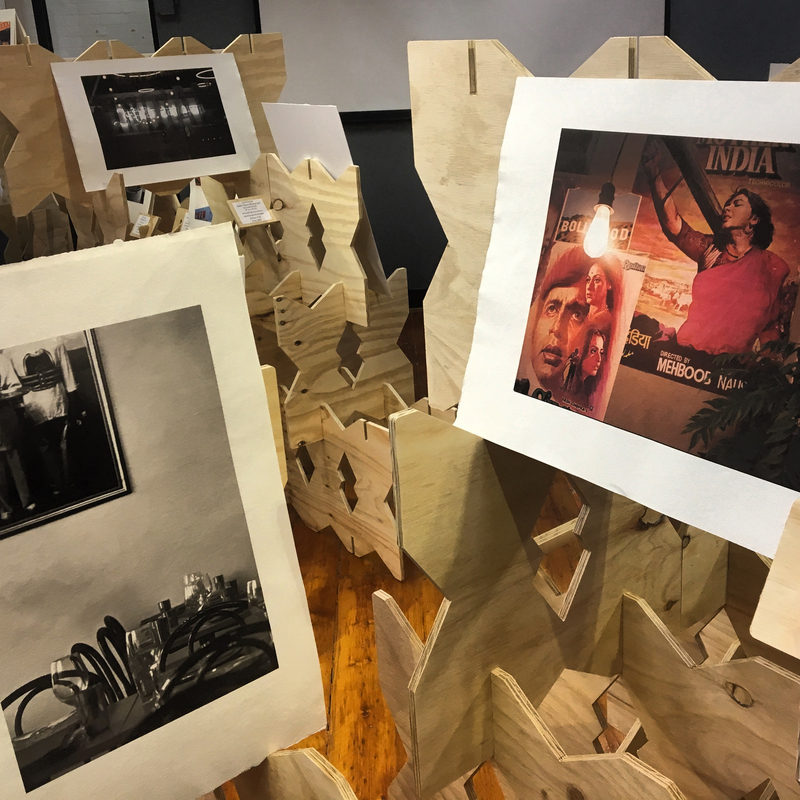 Architect and Atelier Red+Black co-director Sonia Sarangi, has been investigating the evolving Indian culture in Melbourne which has now led to a solo photographic exhibition at Magnet Gallery in Melbourne. The evolution of Indian culture in Melbourne is still very much a work in progress. Whilst many would be familiar with the butter chicken and Bollywood stereotypes, there is far greater diversity and depth to Indian culture than what is commonly portrayed. For Sonia, exploring how the Indian food scene was adapting and thriving within Melbourne was a window into this evolution. The exhibition installation by Atelier Red+Black references the traditional Jali screens of India which often have triangulated geometry and abstract ornamentation. In India these screens are used to divide and define space. The reinterpretation of these screens for the exhibition uses them to frame the images, taking the artwork of the walls and placing them in the centre of the gallery space. Desivolution is part of the Mapping Melbourne Festival, which is produced by Multicultural Arts Victoria. Architecture is one of the most intense university courses one can pursue. 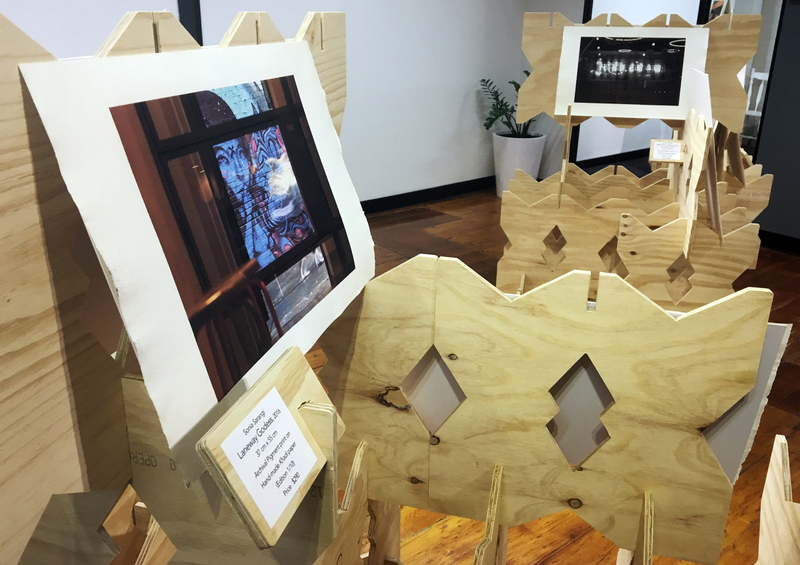 Chelsea Doorne, a fourth year Master of Architecture student, shines a torch on the dark side of the architecture student experience. Architecture school and dedication are synonymous, however more often than not, this devotion to the art of design comes at a cost. A recent survey conducted by the Architects Journal documented that 1 in 4 architecture students are suffering from mental health issues, with a further 26% stating that they would likely seek treatment and professional help in the future. This is hardly surprising given that when searching ‘architecture student’, images of solitary students crouched over models are accompanied by a smattering of ‘memes’ depicting feelings of rejection, chaos, and most predominantly, forced insomnia. This deeply embedded culture of overworking and negativity is one of the primary reasons why mental health is such a prevalent issue within the architectural student community. 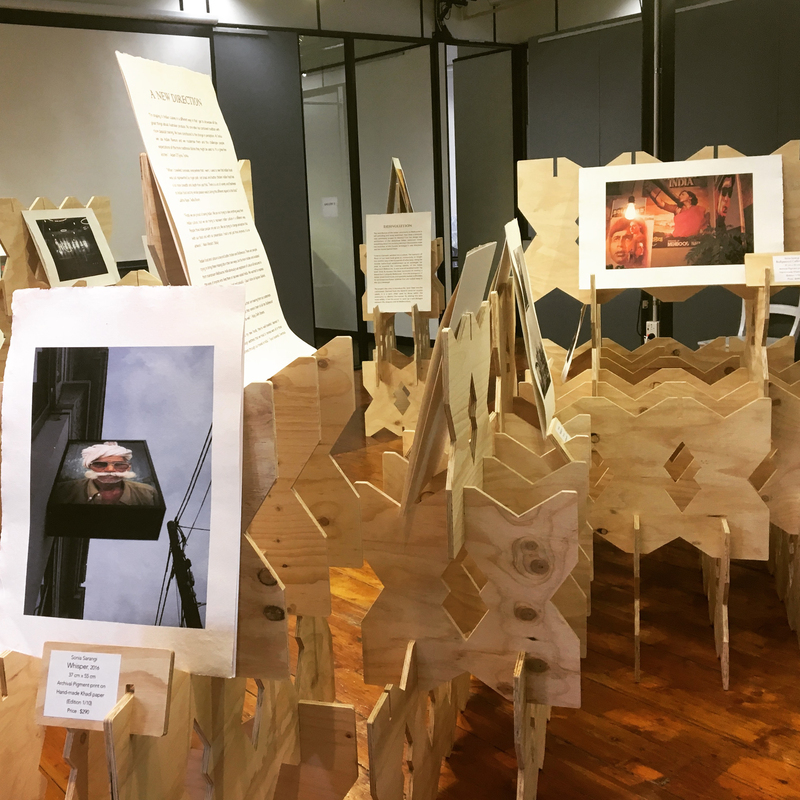 Long hours are one of the most recognisable traits of the architecture student community, with almost 1 in 3 students reporting that they work through the night on a regular basis. This common place experience of sleep deprivation within architecture school is widely known and also referenced by a number of blogs such as architorture school. Among students, stating your longest time awake can become akin to a competition, and often be seen as an implied level of success in the studio realm. This normalising of nocturnal study isn’t just supported by students, with there being an expectation to work throughout the night imposed by many tutors. The large workload of the degree, noted as being one of the heaviest, can also contribute to the frequency of ‘all-nighters’ with the design process demanding an unquantifiable number of hours. It is common for a designer to feel that the process is never truly complete, even when the final deadline has long passed. With one often feeling as though a large amount of improvements which can be made, unlike a finance report, for instance, which is completed when all the data has been entered. The ever present threat of time, or lack thereof, is added to by the expectation of students to work part time in firms to gain experience and in the case of some universities, it is a requirement for graduation. In a course where, particularly at Masters level, most timetables demand the full five days of study, many students are skipping classes to satisfy these demands. The high requirement of these hours along with the prevalence of some internships that (illegally) pay in ‘experience’ over money, lead to many students experiencing financial difficulties throughout their degree. Although the job market for architects is currently looking positive, it is also highly competitive and many universities no longer offer study placement programs, making these positions increasingly difficult to secure. This stress of gaining necessary, yet difficult to find experience, coupled with the already stressful study period is a large contributing factor to the poor mental health of architecture students. These monetary stresses extend into the cost of study which is notoriously expensive. While university text books are expensive across the board, the constant need to print and construct models can often blow an already tight student budget, with some models costing in excess of $300, and printing frequently exceeding $100 per presentation. These expenses (coupled with expensive software, computers and the cost of travel for site visits), can force many students to switch to a part-time load, adding time to an already lengthy degree. 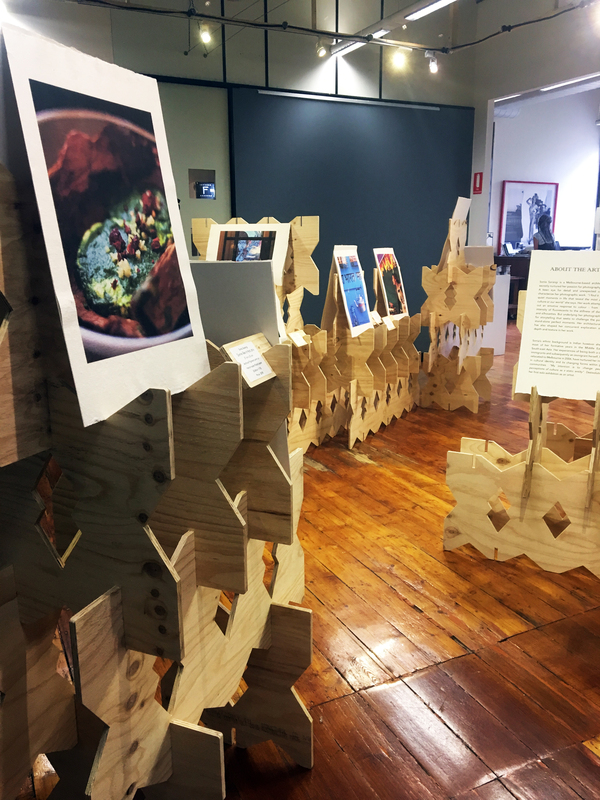 The critique or design review of the architecture degree is well known from day one in architecture school, and the negative stigma that surrounds it is intrinsically linked to the design culture. Design is not as simple as a yes or no answer that can be found in other faculties, such as engineering, instead, it is subjective, leading to confusion between a critic’s opinions versus how the project is received in the studio class among tutors. These critiques are feared throughout the faculty and many students accept that they will often receive a bad comment or a terrible review, regardless of the number of hours and effort devoted to a design proposal. Design is an intensely personal endeavour and is not too dissimilar to an art piece, with heart, soul, sweat and tears being poured into a project. This brings an additional intensity to the critique process and makes a negative reception much more distressing. To those students who are already suffering from mental illness, the toll can be devastating, particularly when coupled with running on little-to-zero sleep, often poor nutrition and an already volatile state of mind, this can only lead to negative outcomes for the student. It is not uncommon to see a shift in the demeanour of students throughout the semester. Ask someone how they are in the early weeks is answered with an upbeat, “great”, or “looking forward to the semester” or something of the like. Ask the same person in week 7 and you’re looking at a less than jovial response. They’re likely either “tired”, or just “fine”. This dramatic shift in attitude in less than two months is sadly commonplace among students. One of the primary issues with this negative ethos of studio critique is that it is deeply rooted in architecture culture and widely accepted, if not expected. The critics of today do not feel it is an overly harsh response as they were treated the same in their time at architecture school, much like their tutors before them. It is normalised and expected that tears and breakdowns will follow a critique and this is where the issue lies. Yes, we need to be prepared for the inevitable future of practice which may involve an imposing director and a less than content client. However when students are learning, this breaking of their spirit through a ruthless critique does little more than demotivate and encourage a negative outlook in the architecture field, contributing to the low mental health state throughout the faculty. Until this cycle of pessimism and demoralisation is broken, we can only expect that the mental health of architecture students will continue to be poor, particularly when a bleak economic outlook is added into the mix for future candidates. Important: If you are experiencing depression, anxiety or other mental health issues, make sure you get help from your general practitioner or organisations such as The Black Dog Institute or Headspace.